Carna Caiseal's Colm Ó Dúbháin and Marc MacFhlannchadha celebrate their victory over Salthill Devon in the opening round of the Galway County Senior Football Championship at Pearse Stadium on Saturday. Carna-Caiseal produced a terrific performance last weekend to defeat the current county champions Salthill/Knocknacarra at Pearse stadium by 2-6 to 0-11. Carna-Caiseal were Galway intermediate champions last season and were 5/1 outsiders to topple Cathal McGinley's charges in this first round clash. Seosamh Ó Cathasaigh hit the onion sack in the opening half for the Connemara men, following a quick free kick by Seán Ó Cuirrín, and that three-pointer was crucial in their first-round victory. Salthill were leading by 0-3 to 0-1 when that goal came, and it provided some real momentum and belief for Sean O' Cualain's men. The city side was far too dependent on Galway senior player Sean Armstrong for scores. And he raised the white flag 10 times (0-6fs ) during the game. Gary Cox was the other man to raise a flag for the Seasiders and they will have to improve on those stats as the season progresses if they are to have any chance of having Frank Fox resting in Arus Bóthair na Trá again this winter. When Ó Cathasaigh stole in for his second goal with 15 minutes left on the clock, the writing was on the wall for the home side. They did have a few late chances from frees to draw the game, but they failed to convert. Carna-Caiseal has a small panel and they deserve immense credit for the way they took on the challenge of facing the county champions. They had fine performances from Donal O'Dubhda, Marc MacFhlannchadha and Seosamh Seoige. 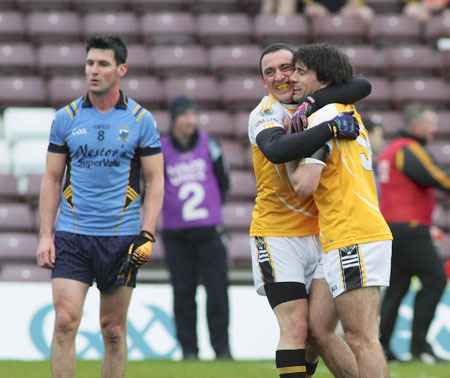 The two goals, which were well taken by Seosamh Ó Cathasaigh, were also critical to their big win. Salthill will face Micheal Breathnachs in the qualifiers and while they will treat that game with caution after last Saturday's malfunction, they would still be expected to advance to the last 16. It should not be forgotten that they were beaten by St Michael’s in the first round last year too, and still went on a fine run in the championship culminating with their win over Tuam Stars in the final. Another city side St Michael’s had better fortune when they overcame Killererin by 2-10 to 0-8 last Sunday. Former St Mary's College star Eddie Hoare was the key man for them at full-forward as he hit 1-03 (3fs ) over the course of the game and won his duel with county player Colin Forde. They had other fine performances by county u-21 star Dave Cunnane at midfield, while Alan Glynn and John Carroll also notched 1-3 (3fs ). Killererin is not the side it once was by any stretch of the imagination and its tale of woe was compounded when talisman Padraig Joyce was given his marching orders for two yellow cards by Brendan Kinneavy. They will face Cortoon Shamrocks in the qualifiers. The other senior city side, St James, suffered a 2-11 to 2-9 defeat to a Michael Meehan inspired Caltra. The Galway star hit 1-5 (1f ) and the other goal came from former All-Star Declan Meehan who is still moving around the park with grace and style. A very fine performance by Brian Laffey at midfield was also critical to this win. St James goals came from Dave O' Connell and Owen Teagle. James will face Caherlistrane in the qualifiers. Elsewhere Kilconly defeated Moycullen by 2-12 to 2-9 and Galway defender Gareth Bradshaw finished off a miserable week from a football perspective with a second early exit from the field of play as he picked up two yellows in that tie. They will face Annaghdown in the qualifiers and will have it all to do to stay in the championship. Hot championship favourites Corofin sent out a genuine title warning with a facile win over Micheal Breathnachs at Pearse Stadium. David Morris has his men well drilled and they led by 1-11 to 0-3 at half-time and romped home by 3-17 to 1-7 with second-half goals from Alan O’Donovan and Ian Burke. Former Hogan Cup winner with St Jarlath's College in 2002 and recent All-Star nominee with Kildare, James Kavanagh, helped new club Milltown pip Caherlistrane by 1-10 to 1-9. Michael Martin produced a big performance for John Concannon's men too and they will be hard beaten. Elsewhere a late goal from Michael Daly was not enough to save Val Daly's Mountbellew/Moylough, who lost out to Naomh Anna/Leitir Móir by 2-14 to 2-11. An Cheathrú Rua walked to victory over a poor Barna outfit that failed to score from play, winning easily by 0-13 to 0-7. Barna will face Mountbellew/Moylough in the qualifers. Tuam Stars handed out a good beating to Cortoon Shamrocks by 1-13 to 1-2. The Stars led by 0-8 to 0-2 at half time. Cortoon’s only score in the second half was a goal from a penalty by Derek Savage, but Conor O’Doherty’s late strike ended Cortoon’s challenge. In the final game of the weekend Kilkerrin/Clonberne edged out Annaghown by 2-16 to 1-17 after extra-time after the sides had drawn 1-13 apiece in normal time. Former Galway minor star Jonathan Ryan was the main man for Tommy Joyce's side.